The ongoing debate between climbing and hang-on tree stand stands has been a long one. At the end of the day, each has their separate uses and situations where one is better over the other. Some hunters may prefer hang on stands because of how they can adapt to oddly shaped trees and trees with a lot of branches. Climbing tree stands require a more perfect tree to work optimally. However climbers have a few notable advantages that may make them the overall better choice in this debate. The versatility of a climber is its biggest advantage over hang on stands. Climbers are better for moving spots when you see game that’s close. They are compact, easy to setup and take down and they are light to carry on the move. Taking down a hang on stand and setting it up at a new spot will make too much noise to properly adapt to getting closer to game. Climbers are a great way to switch spots on the fly. Their mobility is second to none. Also if you’re hunting at night, nothing beats the ease of using a climbing tree stand. Setting up a hang on stand in the dark is just asking for trouble. It’ll take too much of your time and make way too much noise. Climbers really show off their versatility in the dark, allowing you to still move as quietly and quickly as in the day. Climbers are also significantly more comfortable than hang on stands. 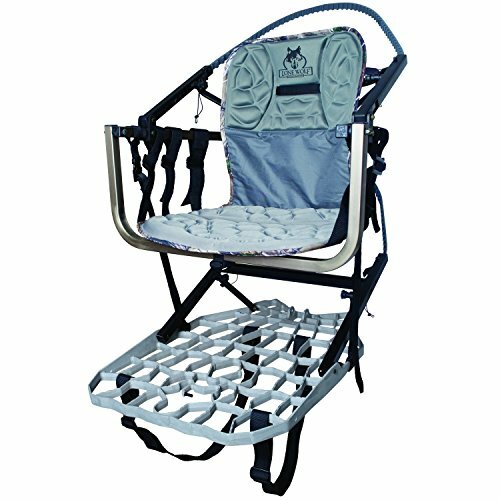 Most climbers are designed with seats that have heavy padding. Spending long periods of time waiting becomes notably easier when using a climber. Your back will thank you for the soft support of a seat with a backrest while waiting! Overall, climbers can fit more situations than hang on stands can. Hang on stands have their uses but climbers are the overall better buy for your money. In terms of quality, mobility and practical features, you can compare the best climbing treestand to the best hang on stand & the climber will have the clear advantage. Can sit facing the tree. Extra wide seat & platform. Footrest lifts to support gun. Insanely comfortable and designed for the big and tall guys, the Summit Treestands 180 Max SD Climbing Treestand brings many good things to the table. The climbing tree stand comes with all the things you need for installation: pads, ropes, straps, and hardware. It’s made of aluminum and handles a maximum weight of 350lbs. There are many features that count on the tree stand, from its adjustable height to the reversible surround seat so you may easily sit facing the tree. The tree stand also comes with 4-point safety harness so you don’t need to worry when using it. Many are impressed with the silence of the tree stand and this is given by the DeadMetal Sound Deadening Technology that lowers the noise as the critical parts are filled with custom-engineered expanding foam. The QuilckDraw cable retention system is great and the cable attachment is both fast and quiet. It’s also easy to use and you don’t need any nuts, bolts, pins or knobs for it. We also have to mention the RapidClimbStirrups are comfort-engineered and easy to adjust for the best fit. It’s made so that it maintains your boot safely attached to the platform and the stirrups let you climb fast. The Summit Lokt Technology comes with accurate welds for best rigidity and amazing power. Every single joint is “locked” into place before welding and the joints are designed so that the stress on the weld is minor. This gives you in the end a quiet, safe and secure stand. The tree stand takes a maximum weight of 350lbs. All in all, the climbing tree stand is comfortable, lightweight, safe and height adjustable which is more than enough for any big guy. 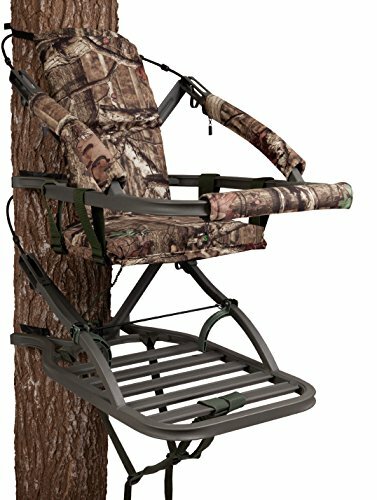 Simple and easy to use, the Lone Wolf Hand Climber Combo II Climbing Tree Stand is a tree stand that any bow hunter should try at some point. The climbing tree stand is very easy to put together and you get a solid, comfortable tree stand in the end. It includes one-piece cast aluminum platform so you may have plenty of room while aiming. The seat pad is nicely contoured and the bow holder fits most parallel limb bows. The back straps are basic, yet efficient and the tree stand also comes with a bungee strap. One thing we really like on the stand is the fact it folds down to a 5” packed profile that is lightweight and flat, with no bulky feel to it. The tree stand takes a weight as much as 350lbs and comes with TMA approved 6-pt Fall Arrest System. You may use it on trees with a diameter ranging from 6” to 9”. Solid, quiet, safe and secure, the tree stand is made in our USA and this may seal the deal for many. Regardless of the minor issues, the climbing tree stand is reliable when bow hunting. Even though comfort may be the best asset of the Summit Treestands Goliath SD Climbing Treestand, the tree stand brings so much more to the table so not taking it under consideration when crossbow hunting, would be a big mistake. The tree stand presents a closed-front aluminum design and has a Mossy Oak Break-up Infinity came finish that is going to help blending so much better in the surroundings. Strong enough to handle a 350lbs. weight, the tree stand is quite lightweight considering its size and pretty easy to carry around. The tree stand gives you plenty of room to move and you may even take a few steps on it. You may stand or sit down when using it. 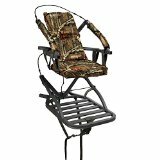 All the great technologies of Summit climbing tree stands are there and the DeadMetal sound-deadening technology means the Goliath is also very quiet when used. Its critical parts are filled with expanding foam, minimizing noise. We also notice the SummitLokt structural enhancement so the extruded aluminum and accurate welds give both power and rigidity. The QuickDraw cable retention system means the cable attachment system works fast, easy and quiet every time, whereas the RapidClimb climbing stirrups are easy to use and to adjust for best fit on any boot. The tree stand comes with a safety harness that is easy to use, increasing your safety. The seat features a backrest and is foam-padded, for more comfort. The tree stand comes with all the hardware you need. Nevertheless, for the comfort, good build and all the good things, the climbing tree stand isn’t to be missed on when completing your hunting gear. 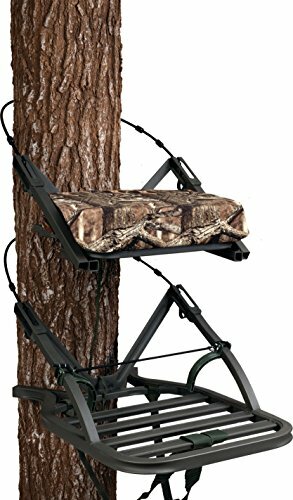 If you’re an entry level hunter or you’re going shopping on a tight budget, take a leap of faith with the Guide Gear Extreme Deluxe Hunting Climber Tree Stand. The climber tree stand is made with steel which explains both its rugged feel and the heavy weight. 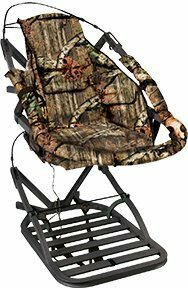 The strong build isn’t the only good thing about the tree stand and we also have the mention the padded backrest and the 1” padding on the seat. The tree stand also comes with armrests so you should be feeling comfortable when using it. The nesting design mean the tree stand is easy to pack and to store. The tree stand easily folds downs for a low profile, becoming easy for transport and storage. 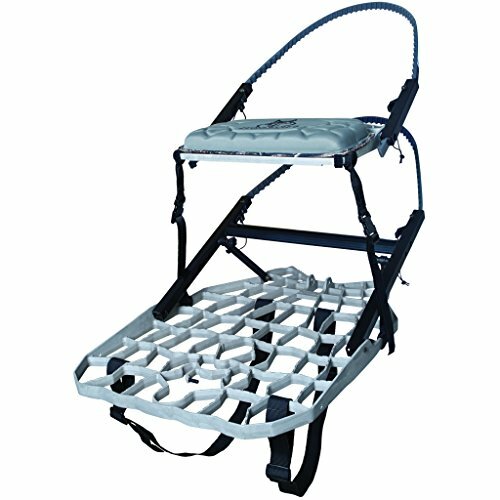 The foot platform gives you plenty of space to stretch out and the sling seat comes with 1” thick foam for more comfort. The tough build of the tree stand makes it tough enough to take weight up to 300lb. The nylon foot straps are easy to adjust and allow easy and fast climbing. The cam-buckle straps lock the foot and seat platform, for safe and secure use. the full-body safety harness is dependable too. Last but not least, the tree stand bites the tree quite well so you shouldn’t have any problems while climbing. It goes without saying that, for the money you’re paying, seeing its durability, tough build and ease of use, the climbing tree stand is quite a bang for your buck. We’re kind of sit on the fence when it comes to the X-Stand Deluxe Hunting Climbing Tree Stand, but if you’re going for the lightweight and friendly price tree stand, you can’t get any better than this. The tree stand is lightweight and highly portable and has a nice list of good things and we wouldn’t call its flaws deal breakers either. You may easily set the tree stand to the height you want and its aluminum build explains its lightweight, durability and stability as well. The nylon washers on every joint bring down the noise, even though we don’t think the tree stand is the quietest out there. The design is well thought out and it includes 3-part design cables that run in aluminum extrusions and have rubber coating for more protection. 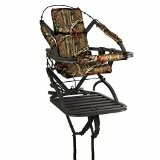 The seat is comfortable and the tree stand has padding in all the right places, which is always a good thing. You may also push the seat out of the way when you want more space and the platform for standing shots is quite roomy. The armrest is also padded and the 4-pt. safety harness is good. We also like the fact the tree stand folds flat and has built-in backpack straps for easier transportation. It comes with an accessory bad and it’s quite user friendly. Needless to say, as it’s lightweight, portable and safe, the climbing tree stand is going to be reliable for many hunters out there. The many good things on the Lone Wolf Sit & Climb Combo II Climbing Tree Stand justify its price and you should see it as a wise investment for your hunting hobby. The tree stand comes with the pivoting “Sit&Climb” bar so you can always climb fast and easy. 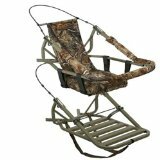 The comfort is also great as the seat pad features a 2-panel contoured foam so you may sit all day long for hunting. The foot platform is nice and you may set it for better setting too. The build is great and the tree stand comes with a one-piece cast aluminum platform, backpack straps, one bungee strap and stabilizing straps as well. The platform has an interesting 3-D camo design and the tree stand fits trees with a diameter ranging from 6”to 19”. One thing we really like about the tree stand is that it folds flat, amazingly thin and compact, making the carrying a breeze every time. It’s easy to attach the tree stand to the tree and it really bites the tree. The climbing tree stand isn’t just safe, easy to use and lightweight, but also adjustable and quiet. As for the built-in bow holder, it’s a treat as it may accommodate most parallel limb bows. As long as you see the climbing tree stand as a good investment as your money, you shouldn’t hesitate on getting it. If you’re in a good shape and you’re not afraid of the challenges, don’t hesitate to give it a go with the Summit Treestands OpenShot SD Climbing Treestand. The tree stand fits the high quality standards of Summit tree stands, but does become special as it’s a non-restricting stand, giving you more freedom of move when hunting. The construction is also rugged and the tree stand takes weight up to 300lbs. it weighs around 15 pounds and it’s compact, which explains its high portability. The design is what set this tree stand apart from the other Summit tree stands as it has an open front that gives you all-direction visibility. 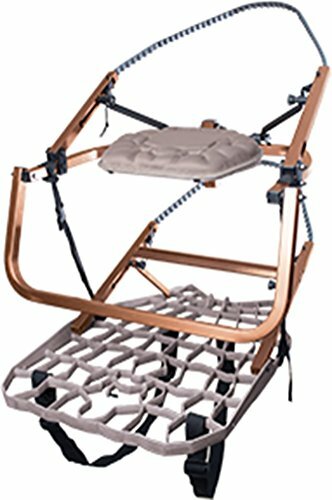 You get everything you need for installing the tree stand, from the Rapid Climb Stirrups, pads, ropes, straps, hardware up to the 4-point safety harness. The seat isn’t just foldable, but also very comfortable as it’s well padded. It also features a cushioned back rest so you may comfortably stand for many hours. The tree stand is fast, easy to use and lightweight. It’s reliable and really a choice for the experienced and well fit hunter. All in all, the tree stand is dependable, portable, safe and great for various hunting. Don’t let the looks or the price of the Ol Man Multi Vision Steel Tree Climber fool you as the tree stand may really surprise you with its features and performances. The tree stand is made of steel and its design is well thought out. It’s highly versatile and its 3-way design allows you to use it in any hunting style: foot rest/gun rest or straight bar. Another great surprise from this one is its silence and the tree stand is one of the quietest options out there. The tough steel construction gives you a heavy-duty tree stand that takes the intense use, without adding the unnecessary weight. Its matte gray finish is long lasting and helps you not to stand out when hunting. The rough construction gives a strong tree stand that takes a weight capacity of 300lbs. The cables are thick and the tree stand bites into the tree very well. It’s easy to use and has a durability feel to it. The seat is comfortable and the foot rest pads are fine. Let’s not forget the instructions that are easy to follow. Portable and rock solid build, the tree stand is part of the Multi-Vision series that is the quietest on the market. Regardless of the problems, for the portability, durability and amazing build, you should give this one a try next time you’re hunting. Comfortable and easy to climb with, the Summit Treestands Mini Viper SD Climbing Treestand is a reliable choice for any young hunter. 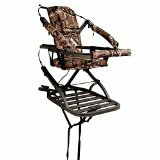 The closed-front aluminum build makes it safe, whereas the foam-padded seat with backrest increase comfort of any young hunter. The tree stand is well build and strong enough to take a weight up to 300lbs. It comes with a full body arrest harness system and all the hardware you need for installation. The setup is easy though and the tree stand is lightweight. The four-point harness features a safety strap and attached SRS strap as well. The design is smart and we notice the aluminum 5-channel platform with Dead Metal, Sound deadening technology that gives you a very silent climbing tree stand. You may raise the seat for bow hunting or lower it when hunting with a gun. The front bar is solid and the climbing isn’t difficult, as the tree stand bites sturdy the tree. Don’t forget you can use the front bar as a gun rest too. The steel climbing cables are coated, taking the use for a long time. The tree stand is safe, lightweight and comfortable, checking all the essential features on a climbing tree stand. No matter the minor problems, the tree stand doesn’t disappoint when it comes to lightweight, comfort, versatility and safety which counts the most on a good climbing tree stand. One of the most popular choices out there, the Summit Treestands Viper SD Climbing Treestand has an impressive list of strengths and only the pickiest customer would find its flaws. The stand has a closed-front design, whereas its aluminum build gives its strength, without adding the weight though. Just because it’s made of aluminum, doesn’t mean the tree stand isn’t strong. By contrary, the Viper SD handles very well weight up to 300lbs. 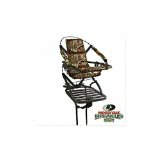 The seat is suspended and has foam padding, increasing your comfort while hunting. The backrest comes in a Mossy Oak Break-up Infinity camo, so you mingle better in the surroundings. You don’t need to worry about installation as the tree stand comes with all hardware you need. It also comes with a Full-Body fall arrest harness system, so you shouldn’t worry about your safety either. The adjustability of the tree stand is great and you may raise it when bow hunting or lower it in case you want to try some gun hunting instead. 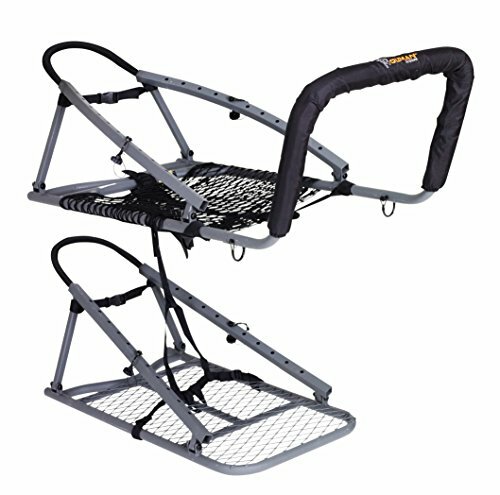 The full-perimeter frame lets you sit down or stand up when using it, whereas its tough front bar lets you easily climb. You may also use the front bar as a gun rest. 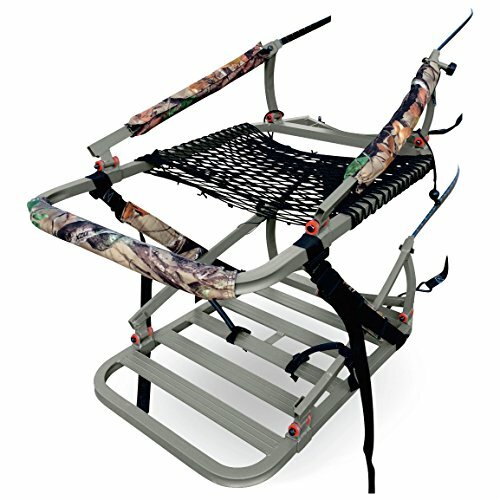 The tree stand is portable and lightweight and has a nesting frame that is back packable. Made with DeadMetal Sound deadening technology and the Quickdraw cable retention system, the tree stand isn’t just silent, but also fast and easy to use. the SummitLokt structural enhancement means the tree stand is reinforced in every joints and the RapidClimb climbing stirrups are easy to use and to adjust for any boot. Easy to repack, comfortable, safe and easy to use. what else would you want? Nevertheless, for the good build and reliability, the Viper SD is the safest choice that you could try. 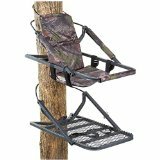 Easy to climb with and to set it up, the Lone Wolf Wide Flip Top Climber Treestand Deer Hunting Climbing is a good tree stand for many hunting situations, including deer hunting. 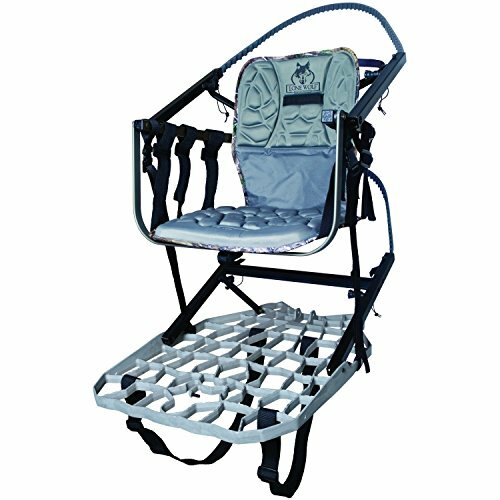 We notice the wide stance of the climbing aid so that you may easily seat while climbing and the padded seat that is mounted higher so you’re always ready to hunt. The seat flips up and out of the way for your shot. The design is well chosen and the seat and platform level out separately for various angles, without any tools. The offset bracket gives you more left to right stand leveling, even in the more special trees. You may use the tree stand with trees of 9”-19” diameter. The seat features contoured-foam padding, but the tree stand comes with backpack straps and one bungee strap also. The 6-point full arrest system is reliable and the 3-D camo platform design blends you better into the surroundings. The setup is easy and the tree stand is lightweight, yet stable. It lets you climb easily and comes with an in cast bow holder. Like it or lump it, the tree stand is great for crossbow hunting and you may appreciate all the good things, despite the minor problems. 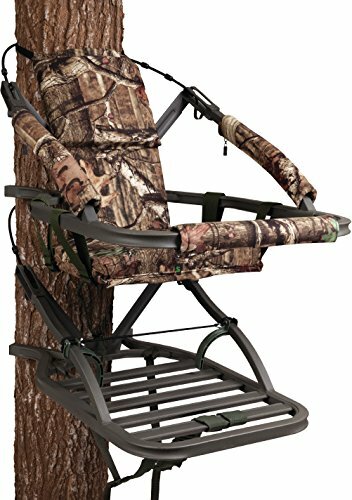 This Lone Wolf climbing tree stand features a 2-panel, 21″-wide contoured foam seat pad that makes climbing and sitting extremely easy and comfortable. The burden of climbing is eased even more with a full sized platform, measuring 30 x 19 1/2″. This platform has a 350 pound rating and gives you more than enough room for your gear. The Lone Wolf “Sit & Climb” is ideal for climbing tress 6” to 19” in diameter. Adding to the comfort & convenience The Lone wolf has a bow holder that accommodates most parallel limb bows. Most users praise the Lone Wolf for being a quiet device that can accommodate people of most heights. In addition to this, it folds away to a slim 4″ profile that’s easy to carry. Users also praise the Lone Wolf for its weight distribution in its folded mode, making it feel like a light 21 pounds. Users have also noted how compact and noiseless the Lone Wolf is in its folded form. The Lone Wolf’s versatility in these areas makes it great for different situations. The Lone Wolf uses a pivoting “Sit & Climb” bar for climbing. This allows you to rely on your leg strength instead of your upper body and arm strength. Most users have noted this make climbing easier on older hunters. This also makes climbing bigger trees and sitting for extended periods of time easier, a key feature among the best climbing tree stands. As far as safety goes, this treestand includes extra backpack straps & 1 bungee strap. It also has a TMA approved 6pt fall arrest system. As said above the Lone Wolf is a fairly quiet device and also features a 3D camo design. The only con about the Lone Wolf is it’s adaptability to taller hunters. While it does have a 350 pound weight limit, people still report it being uncomfortable for those with longer legs and torsos. If you’re a taller person this stand might not give you the best performance during long waits. Aside from that the Lone Wolf “Sit & Climb” is a solid buy for your money. This is a quality stand that has all the features needed in a great performing climber. Summit’s Goliath tree stand is the clear-cut choice for all big hunters. This stand is literally made for everyone, with its whopping 350 pound weight capacity! 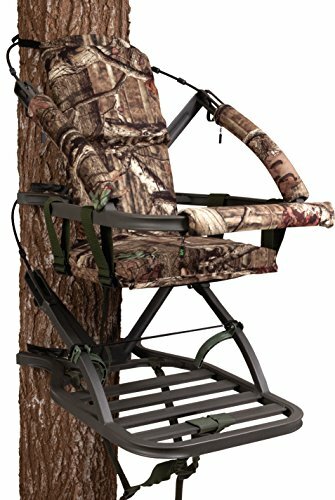 The seat, backrest and armrests have been layered with foam padding making this one of the most comfortable chairs on a climbing tree stand. This chair is designed to be able to easily spend several hours in it comfortably. The Goliath stand features a solid front bar which makes climbing easier. It also gives a convenient place to rest your gun. Most users say this impromptu gun stand is very useful especially during long waits. 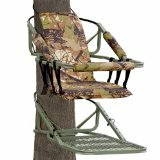 This is truly one of the best climbing tree stand when it comes to comfort. It’s rare to find a stand that will comfortably fit a 300+ pound hunter, while still properly accommodating people of all sizes. People as tall as 6”5 have reported they are able to use this stand comfortably and still feel they have room. 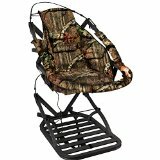 If you are a smaller sized hunter, the extra space you’ll have on your chair will be luxurious. This stand uses the right amount of mechanics and padding to make climbing an easy and comfortable experience. The Goliath is made with sound deadening (SD) technology; it’s designed to be a very quiet device while still maintaining the high level of comfort. The materials are extremely high quality and can obviously stand up to the elements. There are pretty much no cons to this stand. It’s an overall great buy for hunters of all heights and you’ll get your money’s worth in quality. The materials, design and functionality are all top notch. As said before this is an ultra comfortable stand, so if you’re looking for something versatile and comfy – this one is for you.